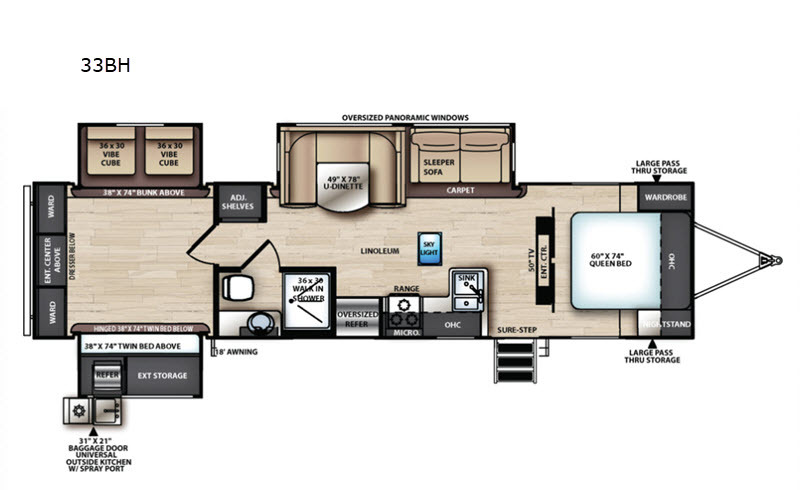 What's better than a travel trailer with an an outside kitchen, a U-shaped dinette, and a front private bedroom? A travel trailer with all those features, plus three slide outs, and a bunkhouse! The dual opposing slides in the bunkhouse provide the kids plenty of room to stretch out or play a board game on the floor. This unit features convenient adjustable shelves inside, plus exterior storage for your larger items. The centrally located bathroom makes it easy for everyone to access it, and with a shower skylight, you won't feel cramped as you clean up. You'll love the oversized panoramic windows in the living room so you can see the beautiful views outside. Get an early start on your next adventure with this Vibe travel trailer! 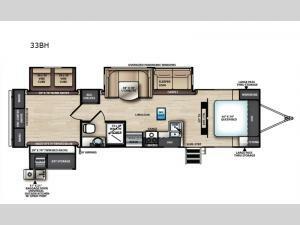 Bunk House, Outside Kitchen and a Large Bedroom for Mom and Dad!